For the 1984 Indian film, see April 18 (film). April 18 is the 108th day of the year(109th in leap years) in the Gregorian calendar.There are 257 days remaining until the end of the year. 1506 – The cornerstone of the current St. Peter's Basilica is laid. 1738 – Real Academia de la Historia ("Royal Academy of History") is founded in Madrid. 1775 – American Revolution: The British advancement by sea begins; Paul Revere and other riders warn the countryside of the troop movements. 1831 – The University of Alabama is founded in Tuscaloosa, Alabama. 1847 – American victory at the battle of Cerro Gordo opens the way for invasion of Mexico. 1857 – "The Spirits Book" by Allan Kardec is published, marking the birth of Spiritualism in France. 1864 – Battle of Dybbøl: A Prussian-Austrian army defeats Denmark and gains control of Schleswig. Denmark surrenders the province in the following peace settlement. 1897 – The Greco-Turkish War is declared between Greece and the Ottoman Empire. 1899 – The St. Andrew's Ambulance Association is granted a royal charter by Queen Victoria. 1902 – The 7.5 Mw  Guatemala earthquake shakes Guatemala with a maximum Mercalli intensity of VIII (Severe), killing between 800–2,000. 1909 – Joan of Arc is beatified in Rome. 1912 – The Cunard liner RMS Carpathia brings 705 survivors from the RMS Titanic to New York City. 1915 – French pilot Roland Garros is shot down and glides to a landing on the German side of the lines during World War I. 1923 – Yankee Stadium: "The House that Ruth Built" opens. 1930 – The British Broadcasting Corporation announced that "there is no news" in their evening report. 1942 – World War II: The Doolittle Raid on Japan: Tokyo, Yokohama, Kobe and Nagoya are bombed. 1943 – World War II: Operation Vengeance, Admiral Isoroku Yamamoto is killed when his aircraft is shot down by U.S. fighters over Bougainville Island. 1945 – Over 1,000 bombers attack the small island of Heligoland, Germany. 1949 – The Republic of Ireland Act comes into effect. 1949 – The keel for the aircraft carrier USS United States is laid down at Newport News Drydock and Shipbuilding. However, construction is canceled five days later, resulting in the Revolt of the Admirals. 1954 – Gamal Abdel Nasser seizes power in Egypt. 1955 – Twenty-nine nations meet at Bandung, Indonesia, for the first Asian-African Conference. 1980 – The Republic of Zimbabwe (formerly Rhodesia) comes into being, with Canaan Banana as the country's first President. The Zimbabwean dollar replaces the Rhodesian dollar as the official currency. 1983 – A suicide bomber in Lebanon destroys the United States embassy in Beirut, killing 63 people. 1988 – The United States launches Operation Praying Mantis against Iranian naval forces in the largest naval battle since World War II. 1996 – In Lebanon, at least 106 civilians are killed when the Israel Defense Forces shell the United Nations compound at Qana where more than 800 civilians had taken refuge. Year 796 (DCCXCVI) was a leap year starting on Friday of the Julian calendar. The denomination 796 for this year has been used since the early medieval period, when the Anno Domini calendar era became the prevalent method in Europe for naming years. Æthelred, was the king of Northumbria from 774 to 779 and again from 790 until he was murdered in 796. He was the son of Æthelwald Moll and Æthelthryth and possibly became king while still a child after Alhred was deposed. Coria was a fort and town 2.5 miles (4.0 km) south of Hadrian's Wall, in the Roman province of Britannia at a point where a big Roman north–south road bridged the River Tyne and met another Roman road (Stanegate), which ran east–west between Coria and Luguvalium in the Solway Plain. The full Latin name is uncertain. In English, it is known as Corchester or Corbridge Roman Site as it sits on the edge of the village of Corbridge in the English county of Northumberland. It is in the guardianship of English Heritage and is partially exposed as a visitor attraction, including a site museum. 1958 – Gabi Delgado-López, Spanish-German singer, co-founder of D.A.F. Year 359 (CCCLIX) was a common year starting on Friday of the Julian calendar. At the time, it was known as the Year of the Consulship of Eusebius and Hypatius. The denomination 359 for this year has been used since the early medieval period, when the Anno Domini calendar era became the prevalent method in Europe for naming years. Year 588 (DLXXXVIII) was a leap year starting on Thursday of the Julian calendar. The denomination 588 for this year has been used since the early medieval period, when the Anno Domini calendar era became the prevalent method in Europe for naming years. Agallianos Kontoskeles was a Byzantine military commander and rebel leader. The Kingdom of Northumbria was a medieval Anglian kingdom in what is now Northern England and south-east Scotland. The name derives from the Old English Norþan-hymbre meaning "the people or province north of the Humber", which reflects the approximate southern limit to the kingdom's territory, the Humber Estuary. Northumbria started to consolidate into one kingdom in the early seventh century, when the two earlier core territories of Deira and Bernicia entered into a dynastic union. At its height, the kingdom extended from the Humber, Peak District and the River Mersey on the south to the Firth of Forth on the north. Northumbria ceased to be an independent kingdom in the mid-tenth century, though a rump Earldom of Bamburgh survived around Bernicia in the north, later to be absorbed into the mediaeval kingdoms of Scotland and England. 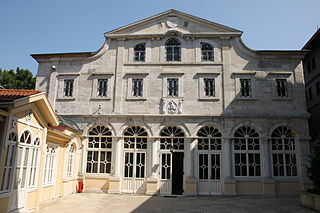 Cyril VI, lay name Konstantinos Serpetzoglou was the Ecumenical Patriarch of Constantinople between the years 1813 and 1818. Eleutherius (or Eleut erus or Eleftherios; sometimes called Liberalis or Liberator, the former transliterations and the latter translations of his and his mother Antia are venerated as Christian saints and martyrs in Albania. Independence Day, celebrates the independence of Zimbabwe from the United Kingdom in 1980. Saint Apollonius the Apologist or Saint Apollonius of Rome was a 2nd-century Christian martyr and apologist who was martyred in 185 under the Emperor Commodus (161-192). Corebus converted to Christianity by St. Eleutherius. Shortly afterwards he was made a prefect of Messina, Sicily. He suffered martyrdom at the hands of Emperor Hadrian in 138. Wikimedia Commons has media related to April 18 . ↑ Sumner, David (2000). "IARU 75th Anniversary, 18 April 2000" Archived 14 April 2010 at the Wayback Machine . The Calendar, International Amateur Radio Union, No. 180, March 15, 2000. ↑ Martin, Allan (1993). Robert Menzies: A Life. Vol. 1 (1894–1943). Melbourne University Press. ISBN 0522844421. ↑ Shelby, Ashley (April 2004). Red River Rising: The Anatomy of a Flood and the Survival of an American City. St. Paul, Minnesota: Borealis Books. p. 66. ISBN 0-87351-500-5. ↑ "Swaziland king changes the country's name". BBC News. 2018-04-19. Retrieved 2018-04-19. ↑ "Albertha Isaacs". Womens Suffrage Bahamas. Nassau, The Bahamas. 2012. Archived from the original on 17 October 2017. Retrieved 3 February 2017. ↑ Grauers, Sven (1920). "Arvid Bernhard Horn". Svenskt biografiskt lexikon (in Swedish). 19. Stockholm: National Archives of Sweden. p. 378. Retrieved May 1, 2018. ↑ "Bl. Savina Petrilli". Catholic Online. Catholic Online. Retrieved 29 October 2018. ↑ "Savina Petrilli, Beata". Catholic.net (in Spanish). Catholic.net Inc. Retrieved 29 October 2018. ↑ Catholic News Service (18 April 2017). "Blessed Savina Petrilli". The Visitor. Retrieved 29 October 2018.